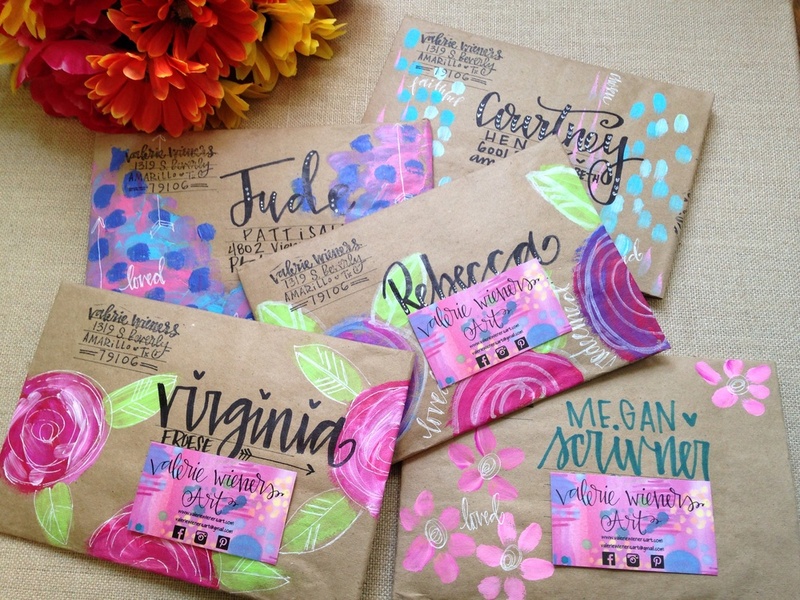 I have been a busy worker bee painting encouraging envelopes to ship your things In... It's beginning to be a job all in itself which I wouldn't have imagined. I am going to have to change the way the painted envelope works. because each envelope takes so much time I've been lacking in actually being able to paint new canvas pieces and work on getting custom orders. There will now be an option where you can choose to have your envelope painted by paying a very small fee. Even if you choose not to purchase this option your envelope will still have some decorations but it most likely will not have paint. Some of these decorations may include metallic hearts or encouraging words, maybe a doodle or two on the front. Your package, no matter what, will include an uplifting phrase on the back because the purpose of the envelope isn't necessarily to make extra money off you it's about speaking life into the dark places of the peoples lives who see it. It takes me around 30 minutes to 1 hour to paint an envelope and letter it, that's where the extra fee will come in. I love doing it and hate that I can't possibly do a painted envelope with every order now but y'all have been amazing with your orders and I can't promise I can keep up with you. I hope you'll understand. many of y'all have surprised someone else with a painted envelope that contained art. This makes me beyond excited and I know some of them have been arriving this week. I'm trying to send each giver a post card saying thank you which when you flip it over is the matching print you gave---this way each time you see the print you'll be able to think of your receiver and pray for them. You giving art not only brings encouragement to your receiver but it also brings encouragement to your mail carriers and to me, thank you for letting me spread hope, joy, art, and jesus!! Posted on May 13, 2014 by Valerie Wieners.